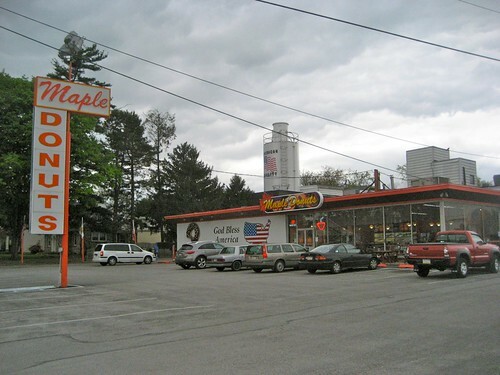 Maple Donuts York PA – Sure Beats Toast! As you can probably tell from my photos, the weather wasn't fully cooperating with my all day plan to drive around and take photos of the cool old vintage and retro places between Lancaster PA and points west. 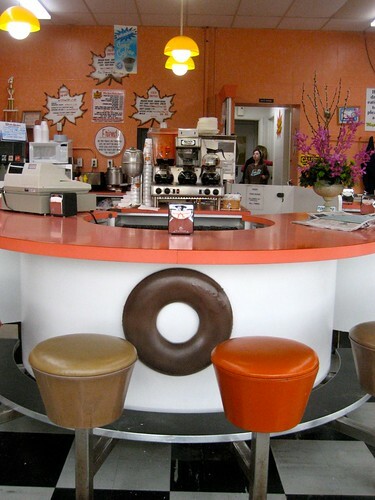 However nothing cheers up a day more than an unexpected donut shop stop with its cheery orange signage, friendly counter help, wonderfully retro interior and of course tasty donuts! Thank you Maple Donuts of York PA for the smile on an otherwise gloomsville day. I was delighted to see that there were plenty of donuts to choose from, and according to reports they have 58 varieties! It is at times like this when I wish Retro Roadhusband was with me, so I could sample more than one flavor, as many of them looked delicious, both cake and raised, frosted, filled, crullers, mmm! Since I couldn't order one of each I did the next best thing, and sampled some of their donut holes. I was going to get a diet Coke (my go-to to-go drink with donuts - a leftover habit from a job I had long ago) but when I saw how delightfully cheery the interior of this shop was, I decided to get a hot tea and sit at the counter. 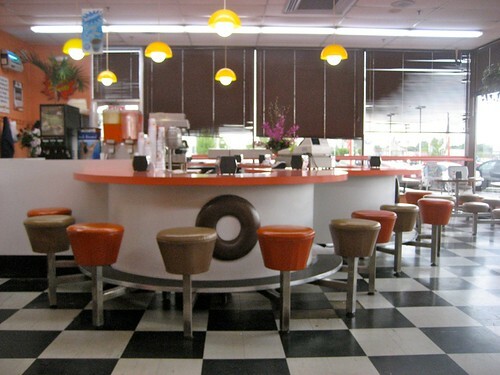 The main counter is a wonderful intersection of multiple circles, and the tables at the window are meant to look like a donut, with a white circle in the middle. How cute is that? I sat myself down at the middle of the big center counter donut at the counter and tried to balance devouring/savoring of these deep fried and sugar coated tasty morsels. De-lish! I dug sitting at the counter waiting for my tea to cool off- to my right there was an older gentleman eying me as I artfully arranged my donut holes on the napkin - hey, all the kids are doing it, pops! To my left I had a perfect view of a family coming in for a dozen, their twin boys, no more than 5 years old I bet, making a beeline for the swivel counter stools, getting in as many spins as they could before mom would herd them back into the mini-van. I smiled at them and they smiled at me, sharing the knowledge that it sure is fun to swivel as fast as you can before mom says no. Kinda sad to think of all those random moments of human connection like this we miss when we're in our cars in the drive through or getting something to go. 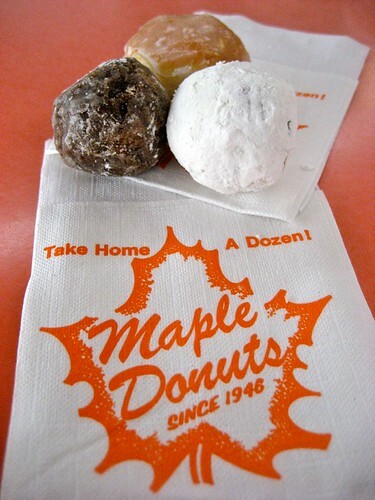 While I have a Dunkin Donuts within a block of The Hacienda, I'd drive over an hour back to Maple Donuts in a heartbeat. It's an easy exit off of Route 30 ( check it on the Retro Roadmap) - so if you're in the area I suggest you make the stop too - you won't be disappointed! LOL … funny that you should post this tonight …. I’m working on posting some pics that I took this morning of their Lewisberry location!! As a lifelong fan of Krispy Kreme here in Florida (and a favorite location in Spartanburg, South Carolina that was always a must-stop while in route to the NC mountains), I was thrilled to see this post. I think I’m a sucker for donut shops. There used to be a Mr. Donut in Bradenton, Florida on Tamiami Trail that had a great vintage sign and a zig-zag roofline (why don’t they make those anymore?!). The donut shop is gone, but I think the remnants of the building may still be there. I was one of those that would always spin the bar stools as much as I could get away, always sneaking in a slow-spin approach after being scolded to still get the effect obviously intended by the designers of the stool! And if you were to insert the words, “station wagon” where you wrote mini-van, your description could have been right out the the 1960s! 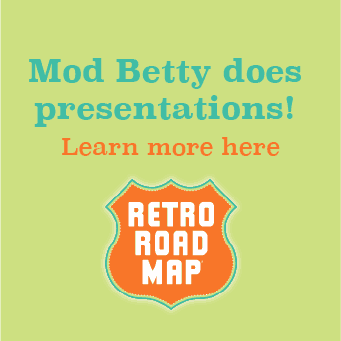 Jeff – it’s funny when I realize that there are certain businesses, activities and foods tend to lend themselves to Retro Roadmappiness (and happiness!) and donuts are definitely one of them for me. This was an unexpected treasure of a find that makes a road trip so much fun. 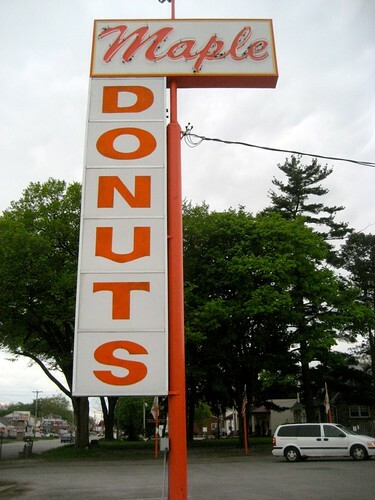 I have to admit that while I love KK donuts, I do hold a huge grudge against the company for buying out the location of the Russo’s Candy House on Route 1 in Saugus MA, tearing down the classic vintage location to replace it with a KK that I think lasted all of 2 years. There were plenty of other places they could’ve chosen, but I now don’t like KK at all because of their destruction of Russo’s. It does make it even better to go to Kane’s Donuts in Saugus for delicious donuts! Heck I may need to start a Donut category to make these sweet treats even more searchable! Thank you for this posting. I looove Maple Donuts and have been trying to get my husband to join me on a pilgrimage to their awesome retro shop in York. Your photos and commentary sealed the deal. Amy – I’m sure you and your husband won’t be disappointed by their tasty treats and throwback decor! You’ll be right around the corner from the Big Shoe in Hellam, so make a day of it!